This book deals with the challenges of addressing the myriad possible issues that can arise in the context of an auto insurance dispute. Auto insurance coverage issues can be very obvious – or very discreet. Auto Insurance Coverage Law in Ontario deals with the challenges of addressing the myriad possible issues that can arise in the context of an auto insurance dispute. 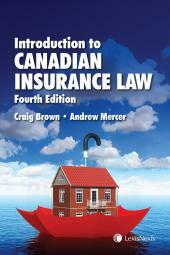 This book is structured to provide a general introduction to insurance coverage and law under the standard Ontario Automobile Policy (OAP 1). The expert authors provide a basic overview of the coverage provided under the OAP 1 as well as an analysis of some of the most common issues encountered, such as determining the scope of coverage and who is covered under the policy. Daniel Strigberger is a partner at Strigberger Brown Armstrong LLP in Waterloo, Ontario where he provides risk and litigation services to many of Canada's leading property and casualty insurers. Daniel contributes to Canadian Underwriter's insurance blog and has also written articles for various industry publications. He was awarded the Waterloo Region Top 40 under 40 award in 2012 and has been featured as a leading lawyer in theCanadian Legal Lexpert Directory in the Litigation-Commercial Insurance section for multiple years. Daniel sits on the Council of the Insurance Institute of Canada – Conestoga Chapter and has been an Executive Committee member for the Kitchener-Waterloo Ontario Insurance Adjusters Association (K-W OIAA) since 2011. Andrew Mercer is counsel at Manulife Financial in Waterloo, Ontario, where he provides legal advice in the area of insurance law. Previously, he represented both insurers and policyholders in insurance coverage disputes. He is also an adjunct law professor at Western University and the co-author of Auto Insurance Coverage Law in Ontario (LexisNexis) and Introduction to Canadian Insurance Law, 4th Edition(LexisNexis). Chapter 3: What is an automobile?